SR [Finished chest measurement for sweaters] = the smallest chest measurement to the largest chest measurement we could find in the book. There may be only one pattern with the smallest or largest size, but it's in there. Most finished sizes fall between the range. Books are softcover unless noted otherwise. 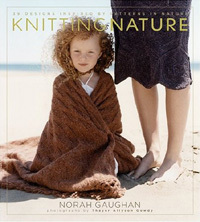 Norah Gaughan has been designing knitwear for as long as I've been knitting. I've always admired her style, the fluidity of her cables, her ability to create interesting feminine designs, but I always sensed that somehow she was holding back on all of us knitters. Well, she's letting her designing heart, soul and mind rip in her first book, Knitting Nature. It's an amazing book; you'll look at it over and over. All 39 of her designs for this book are taken from basic patterns in nature: hexagons, pentagons, spirals, waves fractals and phyllotaxis (the principles govenering leaf arrangement). There are traditional garments with traditional-ish patterning, traditional shaped garments with patterns that will make your brain squint, and garments that, between their construction and patterns, will make you laugh a mad-scientist laugh out loud as you rush to your stash to start swatching. This is an entirely original and remarkable book. 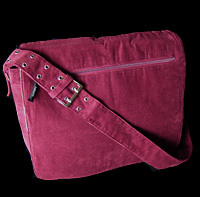 The Namaste messenger bag is as soft and sturdy as your most favorite pair of jeans; it has that always right, never let you down feeling of those jeans too. 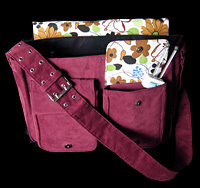 The outside is soft and supple corduroy, the inside canvas, black for the bag part, a funky print for inside the flap. The bag is covered in pockets - 4 inside (one zippered), 2 large snap pockets on the bag and under the flap, and a large zippered pocket on the outside of the flap. The bag is deceptively big too, 16" long x 12" tall x 5" wide -- big enough for a knitting book and a whole project, even a not-so-bulky sweater. There's a special zipper on the bottom of the bag which, when unzipped, expands the bag's width to 8.5" -- enough space to hit a yarn sale! This bag was clearly designed by a knitter. Everything is in the right spot when you reach for it; the fabrics and closures are sturdy (knitters are notorious over stuffers) and non-yarn grabby. I'm a chart person. I didn't used to be -- I used to write out everything line by line on 3x5 cards & flip through as I was knitting. Learning to use charts was a revelation to me, helped me visualize all of my knitting better. And now that I am of a certain age that my ability to see tiny print isn't what it used to be I'm even happier to be a chart girl. This chart soap box is leading up to a mighty fine piece of software. 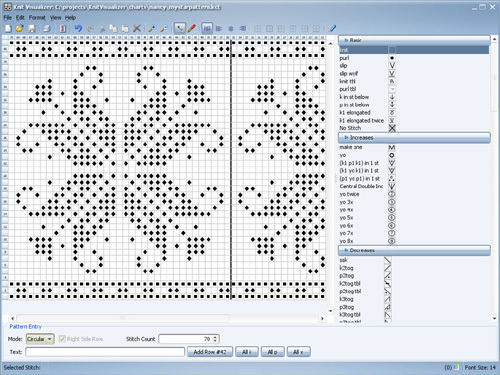 Knit Visualizer will take line-by-line directions and spit out a chart for you. You can build charts from scratch, using the symbol dictionary, or you can use a combination. Line by line directions for cables won't work because there isn't yet a common cable language, but the stitch dictionary has about every criss-cross that cable maniacs can think of. Easy to install and use, available for PC and Mac (!). Come on over the chart side. With more knitters picking up spinning to make their own yarn, Priscilla Gibson-Roberts couldn't have picked a better time to reprint her out-of-print spindling classic, High Whorling. If you have High Whorling you don't need this book, well , unless you're a collector or want a version with amazing new & redrawings by Susan Strawn. If you've ever thought about spinning this book is a fantastic place to start. In her usual fashion, Priscilla Gibson-Roberts breaks down spindle spinning to its most basic and understandable. 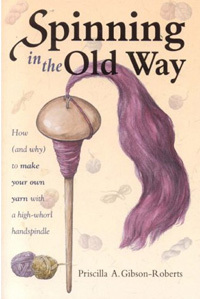 Everything you need to know is here, how to pick a spindle, what fiber to start with, how to stand (or sit), how to hold it all, how to ply and finish your yarn -- all is explained, expertly, in words and illustrations. the index didn't grow with the book. I tried to find kitchener stitch -- everyone forgets how to kitchener -- and I had to go digging through the book to find the pages, instead of being able to turn to it from the index. This is still the best grab and go knitting book. If you are a visual learner (or rememberer), the color illustrations alone are worth buying this new and improved version. Louisa Harding has been in the knitting design business for a while with her work for Rowan and charming Miss Bea children's series, then branching out with her own line of yarns and accompanying designs. While her latest work with her own yarns seems to focus on showing off her yarns to their best advantage, this collection brings the focus to her design work. Natural Knits uses cotton, wool and cotton/wool yarns that are organic, which means wools from sheep raised organically and cotton grown without pesticides. 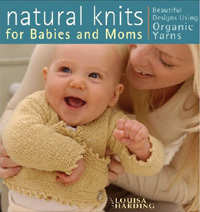 The book is filled with her trademark simple-yet-adorable baby designs (up to 18 months) with detail that only an actual knitting mother would think of: easy non-fiddly closures, button closures to enlarge neck opening, and embellishments that only enhance a baby's cutie-pieness, not compete with it. There are 3 mama sweaters, an adjustable bump sweater and two nursing sweaters, and a nursing shawl too. In the mythical, magical land of Hollywood is a mythical, magical knitting store, The Knit Cafe, where everyone is beautiful and all the knits are effortless and stylish. I want that in a knitting store, or a knitting book --the promise of ease, style & beauty. You want a store that is your dream home away from your lego and laundry-strewn home, where everyone is like family or at least familiar. This book is beautiful. Every aspect of the book from the typeface to the 'extras' - tips & tricks, vignettes about the regulars, reflects the store's sensibility. You want to knit & not just hang out? The 30 patterns in the book are suitably funky but wearable, from a variety of designers including one of my favorites, Kat Coyle. Do you make or sell cool stuff you'd like to see reviewed in Knitty?